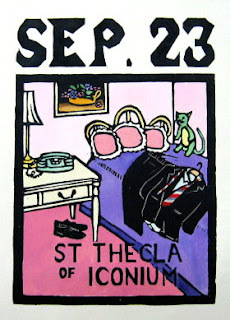 I went into the Studio today and decided to color the second proof I had of St Thecla. Since it is always my procedure to start with the lightest colors and do the darkest last, I didn't color the table top dark right away. As the other colors quickly filled in, I decided that I liked having the whole table an ivory color. There were 3 reasons why I had put the dark top in the first version. First, I have a piece of furniture with that combination, one I inherited from my grandmother. Second, in my online searches for bedroom ensembles I saw some furniture like that and it seemed to work with the other colors. Third, you may recall that in the first colored proof the phone was originally ivory colored (just like the one I drew from, again something saved from my grandmother's apartment), and it would have been too hard to distinguish from the table if they were both the same color. However, I changed that phone to pastel turquoise, so the third condition no longer existed. And I think that the all ivory table is more consistent with the feel of the rest of the room. To compare the two, just scroll down a bit and see the other version. I may try to fix the first proof at some point to match this one, but it's tough to go light over dark with watercolor. Even if I can't bring it to the point where it can be part of the edition, it would be fine as a sample by which to color future copies.